Used for centuries, Baltic Amber has been used for a variety of ailments from teething pain to arthritis. Scientific research has shown that succinic acid has a very positive influence on the human body. It improves immunity and the balance of acids when absorbed into the bloodstream, it stimulates the thyroid glands to help reduce drooling and soothe inflamed areas. Amber’s anti-inflammatory and therapeutic properties are recognized by allopathic medicine as a natural analgesic (pain reliever), which can help to relieve many painful conditions. Both babies and adults can benefit from wearing amber. Natural 100% authentic Baltic Amber is used to make the necklaces we carry. Our necklaces are tested, certified and 100% genuine. Beware of resin or plastic fakes on the market. Amber is associated with sunlight and warmth and reputed to boost the immune system, reduce inflammation, accelerates the healing of wounds, reduce inflammation of the throat, ear and stomach infections and respiratory disease. Amber is unique and has amazing results which are all natural. 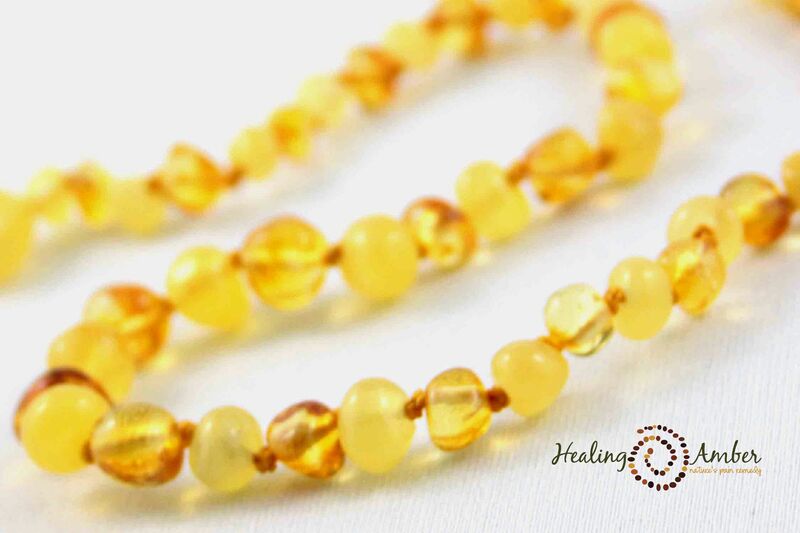 Baltic Amber is a traditional European baby teething remedy, which has become popular all over the world. As a safety feature there is a knot before and after each bead, so that even in the extremely unlikely event of the string being torn, no beads are lost and there is no risk of choking. Amber necklaces are secured with a traditional screw clasp, not a hook and ring and not a magnetic clasp. But…as with all things, please don’t leave children unattended with their amber necklace or bracelet on. Your amber will last many lifetimes and can be passed down for use by more than one child without losing effectiveness. The silk string or elastic will wear out before the beads ever do. If and when this happens, feel free to restring it or make it into something else fun and beautiful. What size of Amber necklace does my baby need? Amber is meant to be worn, not chewed, so choose a size for baby that they cannot get up over the chin and into the mouth. Generally 11inch for babies 3-6 months and 12-13 inch for babies 6+ months of age. We recommend measuring baby or trying one on before purchasing. How Do I Clean My Amber Necklace? Can you wear amber in the shower, bath or swimming pool? Absolutely! The water will help the amber warm up which increases absorbency, thus increasing the effectiveness. (Gently clean the amber with a damp cloth to remove any chlorine or other film after swimming). Hazelwood comes from the branches of Corylus cornuta, a widespread indigenous bush that grows throughout many regions of Canada. Harvesting the twigs doesn’t affect the vitality of the bush, which grows back continuously after pruning. Natural 100%, sustainably harvested hazelwood. skin disorders (acne, eczema, psoriasis). In literature, most of these symptoms above are related to acid-base imbalance and/or inflammatory processes. Similar to amber, hazelwood necklaces are meant to be worn, not chewed. The clasp used for these necklaces has been carefully chosen for the safety of young children. The resistance of this clasp is weak while that of the wire is strong. So if tension is applied on the necklace (for example, if the necklace gets caught on a thread of the bed cover), the clasp will open but the thread will remain intact thus preventing the beads from falling off in the infant’s bed and reducing chocking hazards. In addition, there are two clamps at each end of the clasp to prevent beads or small parts from breaking free. Pure Hazelwood, the brand we carry at Cloth Diaper Kids conducted normative testing for “child safety” with an accredited laboratory on the necklaces and its components to ensure the absence of heavy metals and to validate the security system of their products. * This security is valid only on necklaces changed every 3 months maximum. So, for maximum clasp safety and maximum effectiveness of the hazelwood itself, replace your hazelwood necklace every 3 months. Do not allow babies or children to handle or wear the necklace while in a crib, bed or cot or while unattended. After a while, contact with water, air and movement, will wear out the wire used to make the necklace, which can weaken significantly. Remember to renew the necklace when it shows signs of excessive wear. Yes, this is the biggest difference between amber and hazelwood. Amber does not wear out, hazelwood does. Replace your hazelwood necklace when it shows wear or aprox. every 3-6 months for maximum effectiveness. What size of hazelwood necklace does my baby need? Can you wear hazelwood in the shower, bath or swimming pool? Hazelwood is highly resistant to water (clear water). You can keep the jewelry on in the shower or bath, however, it should be removed if going in the swimming pool. Chemicals such as chlorine can damage the hazelwood. So which is better? Amber or Hazelwood? The anti-inflammatory properties of amber and hazelwood are different so some babies may do better with one or the other. Keep in mind that sometimes babies need difference doses, the same way one person might need one Tylenol and another may need two to get relief, some babies wear both amber and hazelwood simultaneously or wear 2 amber or 2 hazelwood to get the relief they need from the pain of teething. Generally, one necklace of either kind is sufficient. Find a necklace that will help baby’s pain. At Cloth Diaper Kids we have used these products on our own children with great results and we carry a large selection off all colors of amber (child & adult sizes) as well as hazelwood. Categories: Amber & Hazelwood Teething Necklaces | Tags: amber, amber sizing, hazelwood, natural remedy, teething pain | Permalink. There’s a lot of mis-information about amber, a lot of fake amber and a lot of peddlers who just want to make a quick buck by telling you one kind is better than another. Know your amber facts and buy your amber from a trusted source. At Cloth Diaper Kids we only carry certified, tested, guaranteed real Baltic Amber. Genuine Baltic Amber contains 3-8% succinic acid (and only Baltic Amber). There are many sites that claim one color is better then the other. We have not been able to find any true studies to prove that one colour has 3% and another has 8% or vice versa. Many people think that the lighter the colour the better, but many others say darker is better. Without ‘proof’ that one has more succinic acid then the other, the only way we can make judgements is by client testimonials. Lucky for you (and us), ALL of our amber has had rave reviews for helping with pain!! So, please, buy the design that you love the most. If you still aren’t sure, we have many different designs that have several different colours combined so you get the best of both worlds!! All of the amber we carry is ‘raw’ amber. It is in it’s original state and has not been heated, treated or altered in any way. There are 2 different styles: polished and unpolished (many people call unpolished amber ‘raw’ amber). All of the amber starts out with a matte/raw finish and to get polished beads, they are tumbled in a container with teeny glass beads that give it a shine, kind of like using sandpaper. Most raw/matte finished amber will become polished over time with wear. They all have the exact same effectiveness as they are all genuine Baltic amber in it’s natural form! So, again, pick the style you like the best. Nope, what the sun does is warm it, which softens it, which increases effectiveness for the time being. The same way that baths and showers do! Amber doesn’t need any special treatment, it is what it is and works when warmed against your skin. Period. No re-charging nonsense necessary. There are lots of claims that there is a lot of fake amber out there and there is!! Most of the fakes are the large pieces with inclusions (bugs etc) inside. These sell for top dollar!! The amber products that we sell, are small pieces of amber that you wouldn’t find in an expensive jewelry store, collectors site or museum. Our products are made from the smallest of amber pieces. Think of diamonds, the smaller the piece, the value goes way down so there isn’t any real reason to create fakes for them. If you would still like to test your amber, use ¼ cup of salt and 2 cups of warm water ~ mix well. Place your amber in and it will float if it’s real, sink if it isn’t. (Rinse all of your amber after you take it out of the salt water before wearing). Note: there are other ways to test amber as well (the burn test for example, however this involves destroying your necklace and isn’t fool proof). Also, keep in mind that many things can affect the salt water float test, such as the weight of the string and the plastic clasp which may cause real amber to sink when in fact it is genuine. The only true way to test your amber is to take it off the string, thus destroying your necklace. So, how can you know your amber is real without ruining your necklace? Buy your amber from a trusted source. At Cloth Diaper Kids we only carry certified, tested, guaranteed real Baltic Amber from Healing Amber, a company that’s been around a long time and sources it’s amber direct from Europe (not through intermediaries). Categories: Amber & Hazelwood Teething Necklaces | Tags: amber, dark amber, light amber, polished amber, raw amber, re-charge amber, real or fake | Permalink.